More “American Exceptionalism” in revised U.S. History AP course guide. 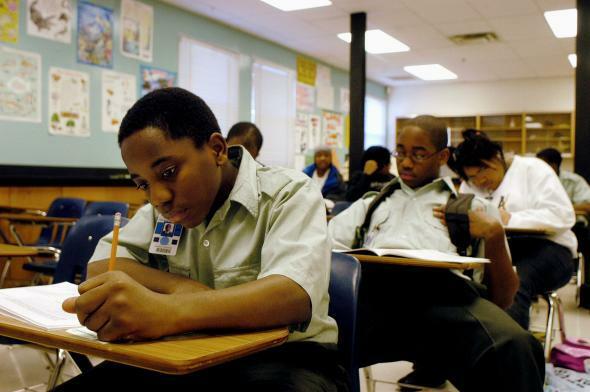 High school students take a final exam in Forestville, Maryland. The framework for how teachers teach U.S. History Advanced Placement courses in classrooms across the country is set to be revised for the second year in a row on Thursday, Newsweek reports. The new outline, around which teachers create their own curriculum and lesson plans, comes with a little more postive spin on America’s past, a year after the amended course outline caused a collective aneurism among conservatives that it was not sufficiently pro-America. Several states introduced legislation aimed at banning the American history course after last year’s update; the Republican National Committee voted to withhold federal funding from the College Board, which creates and administers the test; Republican presidential candidate Ben Carson said that version of the AP test would have students “ready to sign up for ISIS” upon completion. …a new section on the concept of “American exceptionalism” has been added. Some names that were omitted from last year’s framework, such as Benjamin Franklin, Thomas Jefferson, Alexander Hamilton and John Adams, have been added—a key sticking point for critics of the prior document, who objected to Founding Fathers being omitted and negative aspects in American history being more emphasized, they claimed, than positive periods. “The AP U.S. History course is an advanced, college-level course – not an introductory U.S. history course — and is not meant to be students’ first exposure to the fundamental narrative of U.S. history,” authors of the test wrote in a letter last fall. The takeaway being: This is a deeper dive into American history aimed at developing critical thinking skills, not a survey course of American awesomeness. The College Board confirmed to Newsweek that “American exceptionalism” was included in the new framework and that it was left out previously only because “the organization assumed it wasn’t something it needed to spell out as part of what would be taught in an American history course.” They were obviously mistaken. *Correction, July 29, 2015: This post originally misstated the number of mentions of slavery in the AP test framework declined in the new version; the number stayed approximately the same.